Last Saturday, I gathered up several of my friends and headed off to Annapolis for a full day fishing trip aboard Dancer Sportfishing with Captain Joe Richardson. Our goal was trophy Striped Bass, or Rockfish as they call it locally. We met up with Captain Joe and our mate, Dorothy, at 5:45 AM to get our day started. Joe didn’t have the best news to start the day – the weather was pretty iffy. He gave us the option of cancelling, rescheduling, or giving it a whirl and see what we could do. My buddies and I figured we’d made the trek out there and got up early, so we may as well give it a shot. We packed up the boat and left the docks. Leaving the docks was a fairly impressive task in itself – the 37′ Sportfisher had less than 6 inches of clearance on either side between it and a couple sailboats, yet Joe somehow managed to extract the boat without even so much as a bump. Having piloted several boats that size and bigger and smaller, I know how tricky it can be to precisely navigate a boat in tight quarters when fighting both current and wind. I’m sure the neighboring sailboat owners greatly appreciate Joe’s skill! We cruised out to the fishing grounds and Joe and Dorothy set out the planers and the lines. 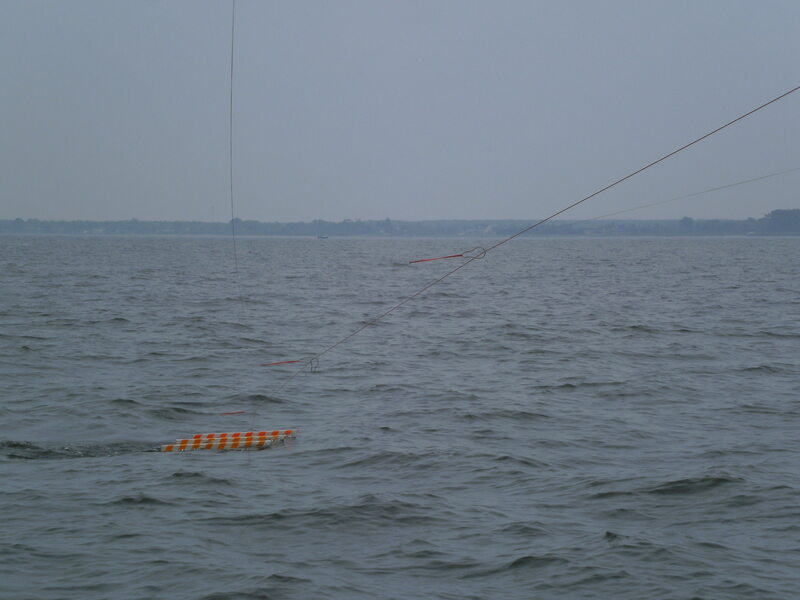 A planer is a device that replicates the functionality of an outrigger. 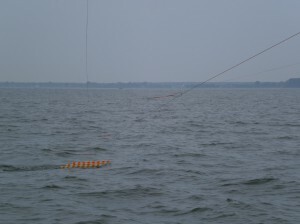 It allows you to run lines the follow the boat, but are well outside the actual path of the boat – in essence, you can run more lines and increase your chances at a hookup while minimizing the risk of a tangle. We ran a spread of six alewife rigs, a couple bottom rigs, and a spoon. The waiting game was on as we trolled through the Bay, just waiting for one of the rubber bands to pop, letting us know our fish had been hooked. Joe and Dorothy told us the fishing so far this trophy season was typical spring fishing. One day would be on fire and you’d limit out in an hour, the next you wouldn’t even get a bite. We had no idea what to expect on this cool, overcast day. The first hour was quiet. Between that and the early start to the morning, most of us caught a quick power nap. I’m sure enjoying the Annapolis nightlife had nothing to do with our heavy eyelids either. A little while after our quick refresh, we’re standing around the deck chatting, when suddenly we hear the POP! we’ve been waiting for. Two of our lines went down, and we scrambled for the rods. Unfortunately, the battle ended shortly after it started. I’m not sure if we didn’t keep the line tight enough, if we just didn’t have the fish hooked well, or if we pulled the hook, but that fish was lucky enough to see another day. Our other line never really had anything hooked that we could tell. It either popped when the first line went, or got fouled by a school of alewife. Dorothy reset our lines, and we went back to the waiting game. A little later on, another pop. This time, we were determined not to let it get away. I grabbed the rod, and knew this wasn’t a small fish. The fish made a run and the drag started screaming. 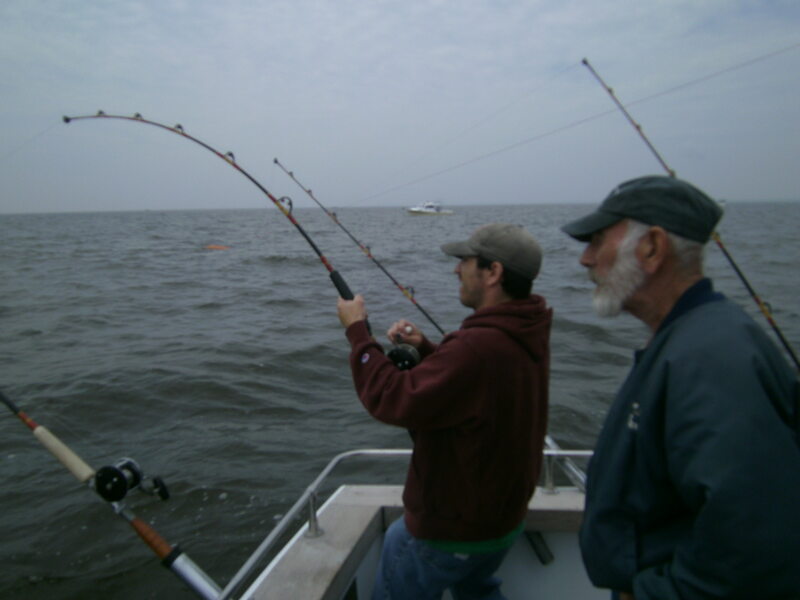 I kept the line tight and began gaining ground on the fish with the standard lift up/reel down tactic. The fish made several runs before I handed the rod off to one of my friends. Since it had been a bit of a slower day, I wanted to be sure we all got a chance on a fish. Charlie took over and wrangled the fish into submission like a pro. It may have been one of his first times fighting a fish like this, but you wouldn’t have been able to tell by watching – and luckily, neither could the fish! 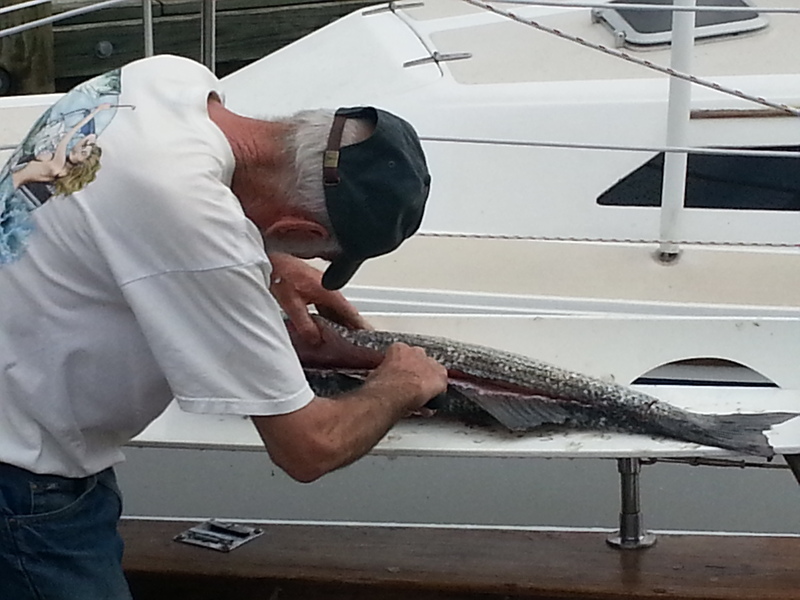 Charlie got it to the side of the boat, and Dorothy netted our catch. 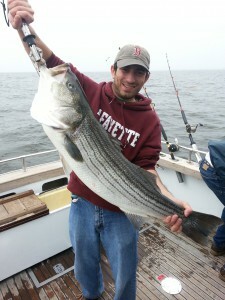 This striped bass hit the scales at 36 inches and 21 lbs – and sure tasted good too! We won the battle against a very nice sized Chesapeake Bay Striper. We did a quick photoshoot and stopped for measurements before throwing this 36″, 21 lb fish into the icebox for a good meal later on. Dorothy reset our lines after the excitement was over. As the day grows old, we’re hoping for another shot as we enjoy a beer on the deck. Just as these thoughts cross our mind, the rod with the spoon doubles over, and the reel starts screaming. We’ve got another fish on! Unfortunately, this fish was a little better than we were that day, and freed itself shortly after we hooked it. It turned out to be our last shot at a fish that day. Joe slowly brought in our lines and headed back to port. Fishing with Joe and Dorothy was a ton of fun. Even though the fishing was on the slower side, we still had a great time. We got to trade some fishing stories with some seasoned pros, and Joe and Dorothy did everything they could to make sure we were comfortable and having a great experience. 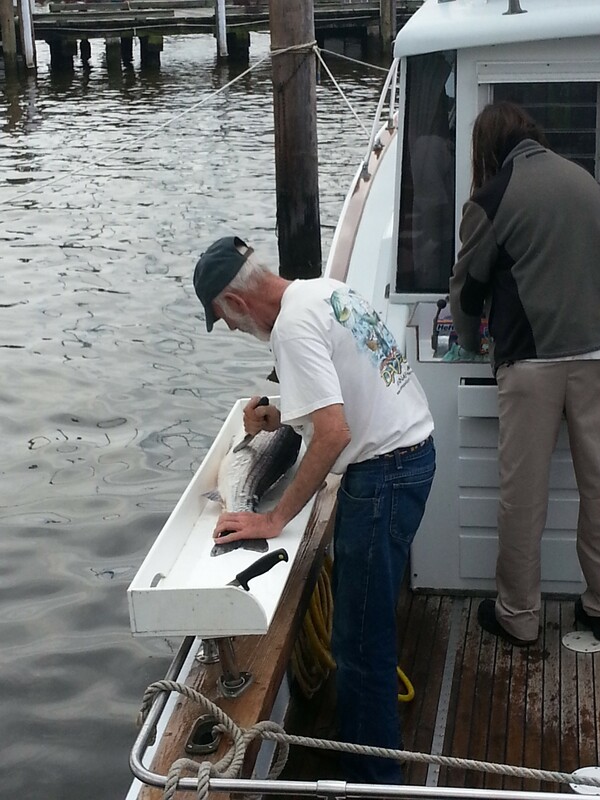 We got back to the docks, and Joe cleaned and packaged up our fish. Dorothy recommended a few recipes to cook our catch, and we excitedly went home to fire up the grill. Our total trip time was around 8.5 hours even though we were only scheduled for 8. 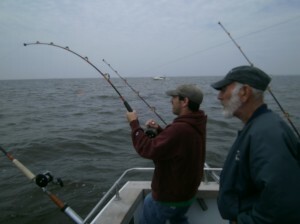 Hopefully we’ll be able to get back out with Joe and Dancer Sportfishing soon! Ready to book a trip with Dancer Sportfishing? Captain Joe can be reached by email at captjoer@verizon.net or by phone at (410) 570-4632. Rates start at $400 for a 4-hour evening trip.